Taking action as quickly as possible will help speed recovery. When it comes to golf injuries, the leading cause is having bad form. If you sprain your ankle you should consider what type of golf shoes you're wearing. Make sure that you wear regulation golf shoes at courses and consider replacing the spikes or your shoes if they appear worn or damaged. However, if you do sprain your ankle you must take the appropriate steps for recovery. Stop applying pressure to your ankle immediately after you've sprained it. More damage can occur to the ligaments of your ankle if you continue playing golf or walk a long distance on it. If you have a golf cart with you, ride back to the club house or have someone help take you there. Sit down somewhere comfortable and rest your ankle. If there is a physical trainer at the golf course you're at he or she might be able to help you quickly. If not you should see a doctor as soon as possible to obtain an ankle brace or crutches for a serious ankle sprain. Apply ice to the swelling of the ankle. It's best to use an ice pack wrapped in a cloth rather than apply ice directly to the ankle. Also, ice for no more than 20 minutes at a time. Add compression to the swelling after you've iced the ankle enough that the swelling has gone down some. 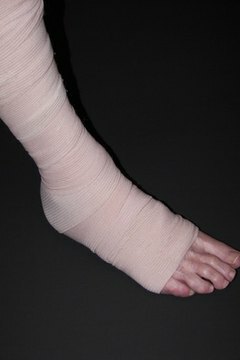 According to the American Orthopaedic Foot and Ankle Society, it is recommended that you apply compression to the swelling using an ACE bandage (see References). Elevate your leg with the swollen ankle while it heals and when you sleep. For example, you should use pillows to prop up your foot. Try not to rest your ankle on the side of the swelling. Continue resting your ankle and repeating these steps until it is completely healed.